Egypt: Security & Economic Developments in Sinai - Egyptian Institute for Studies. The seventh month of the Egyptian Army’s comprehensive military operation “Sinai 2018” is characterized by the return of the old guard to the scene. Abdel-Fattah Al-Sisi has recently appointed Maj. General Mohamed Abdul Fadel Shousha as governor of North Sinai. Shousha, whose Ph.D. thesis was about development of Sinai, was a governor of North Sinai in 2008, and had a very bad reputation among the Sinai tribesmen. Also, Maj. General Mamdouh Abu-Zaid was appointed as director of the North Sinai Governorate Investigations Dept. He had served as Criminal Investigation Officer and Inspector General of the Governorate before the January 2011 Revolution. He also had a bad reputation because of his bad rights record and the violations against the Sinai people. – Thirty-nine militants were killed in various parts of northern and central Sinai. Five machine guns, ammunition and one explosive charge were in their possession. – Arish national security forces killed 13 militants. Three machine guns, one shotgun and two explosive charges were seized. – The Armed Forces and police arrested 49 militants in northern and central Sinai. 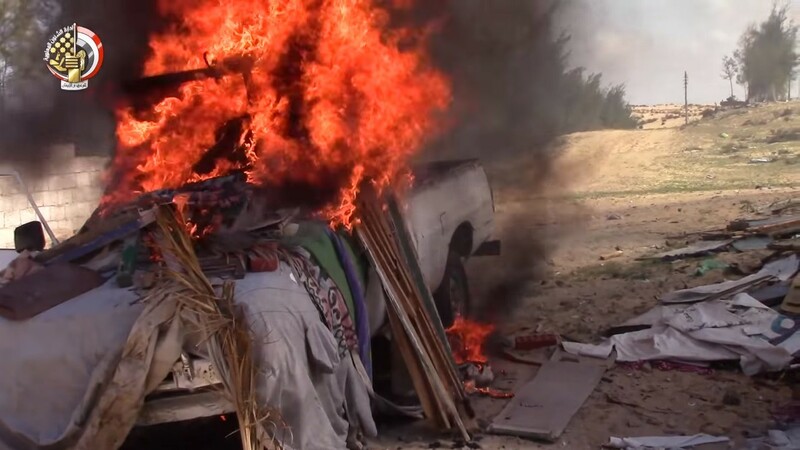 – The forces also destroyed 12 vehicles and seven motorcycles without license plates that were used by terrorists during their criminal operations. A fuel storage point used by militants in central Sinai was also destroyed. – Twenty-six havens and caches in central and northern Sinai were destroyed. Military clothes of militants were found in these hideouts in addition to books and tapes promoting the jihadist thought. A wireless communication equipment was also found. – Four tunnels were destroyed on the borders of Rafah city in northern Sinai. – At least 17 military personnel were killed, including 4 officers, in addition to the assassination of a former candidate to the People’s Assembly. – At least two military personnel were injured, including 2 officers, while the Egyptian regime attempts to cover losses and casualties. 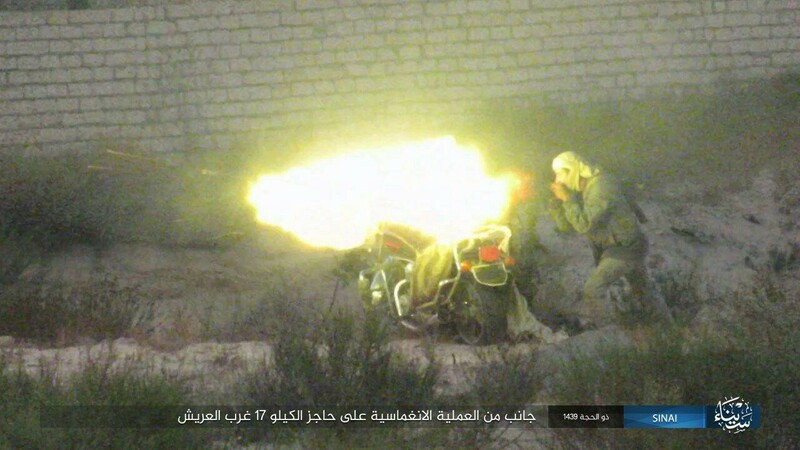 – With regard to attacks and ambushes, the IS-affiliate Sinai Province launched two attacks in Al-Arish area against the police forces and carried out a car bomb attack against an army force. – The Sinai erected more than 2 ambushes against the army forces and local militia. – More than 8 armed clashes tool place against army forces in the areas of South Sheikh Zwaid and Rafah. – A number of 5 cases of targeting army and police individuals with sniper rifles. – Militants detonated more than 19 anti-tank and anti-personnel devices, resulting in the destruction 22 military vehicles. a- The return of the old guards of the Mubarak regime to the scene, where Abdul Fattah al-Sisi, re-appointed Maj. General Mohamed Abdul Fadel Shousha as governor of North Sinai. Shousha, who occupied the same position in 2008, and worked as the governor of South Sinai in 2010, had a bad reputation in dealing with tribesmen. Minister of Interior Maj. General Mohammed Tawfik appointed Maj. General Mamdouh Abuzaid as Director of the North Sinai Governorate. The re-appointment of officers who served during the Mubarak era is part of the Ministry of Interior’s strategy to benefit from them for their experience in the counterterrorism file. Maj. General Mamdouh Abuzaid had served in Sinai before the January Revolution (2011) in several positions, including the positions of criminal investigation agent and inspector of public security . b- The two military statements that were issued in August about Operation Sinai 2018 failed to recognize the losses and casualties of the armed forces, despite the documented deaths of a number of officers and soldiers. c- The Egyptian regime adopts a military-oriented policy that relies on the use of force and tightening the security grip in the Sinai. Although this policy might be successful in the short term, but it contributes to accumulation of problems, causing bad consequences in the future. d- The Sinai Province organization is still capable of launching armed attacks against the army and police forces, albeit less efficiently and at a low pace. e- The militant organization is still capable carrying out successful security operations in the city of Arish. f- The Egyptian armed forces maintain isolation of areas south of the city of Sheikh Zuwaid in order to stifle some elements of the militant organization in those areas, according to the army. g- Continued intensive activity of Israeli drones in terms of survey and targeting members of the Sinai Province, where August witnessed various missile attacks. h- The army maintained demolition of houses and bulldozing of agricultural land in the Rafah area inside and outside the area that was declared a buffer zone. According to official figures, the losses of citizens resulting from the bulldozing of farms only exceeded one billion pounds. j- The army and police forces maintained the policy of physical liquidation of detainees who are suspected of belonging to the militant organization. The National Security apparatus extra-judicially killed 11 detainees on 5 August, and 12 detainees on 12 August. a- On 1 August, Israeli drones overflew the airspace of the south and west of Rafah and Sheikh Zuwaid and targeted Al-Tuma village, south of Sheikh Zuwaid, and Shabana village, south of Rafah and Balaa village, west of Rafah with four missiles. b- On August 5, an Israeli drone fired three missiles at targets in the western part of Rafah City. c- On 12 August an Israeli drone carried out reconnaissance in the villages of Balaa and Yamit in the Egyptian Rafah area. d- On 21 August, Israeli drones carried out aerial reconnaissance and targeting of areas south of Sheikh Zuwaid and Rafah. e- On 22 August an Israeli drone fired a missile the village of Masoura in Rafah, in coincidence with the flight of Israeli reconnaissance drones in areas south of Rafah. f- On 25 August, Israeli drones carried out aerial survey of the villages of “Al-Tayrah, Al-Masurah, and Abu-Holu in Egyptian Rafah. g- On 27 August, two Israeli drones carried out aerial survey the Egyptian Rafah port, Yamit Village and some villages south of Rafah. Late August, Abdul Fattah al-Sisi appointed Maj. General Mohamed Abdul Fadel Shousha as governor of North Sinai. Shousha, who occupied the same position in 2008, and worked as the governor of South Sinai in 2010, had a bad reputation in dealing with tribesmen. The Ph.D. thesis of Maj. General Shousha was about the development in Sinai. a- Losses to farmers in North Sinai amounting to more than one billion pounds, as a result of the bulldozing of farms the Egyptian army forces. b- Complete eviction of Rafah beyond the declared buffer zone. c- The interruption of drinking water for long periods in many neighborhoods within the city of Arish. d- The indiscriminate and continuous detention of residents of the cities of Sheikh Zuwaid and Rafah at the military and security checkpoints in Sinai, which led to reducing their ability to movement, trade and medical treatment. e- Continued fuel crisis resulting in raising the fees of transportation. f- Frequent power interruption in the cities of Rafah and Sheikh Zuwaid. g- Continued disruption of telephone lines, mobile networks and the internet in the cities of Sheikh Zuwaid and Rafah as well as various areas of North Sinai.